Not only do we excel when it comes to fixing all kinds of garage door malfunctions, we're also experienced with gate repairs. We can handle new installations, maintenance and troubleshooting when something goes wrong. When your opener stops working, you'll only be able to open and close your gate manually. Our company is at your service, no matter the type of opener you use or what its brand is. We’ll determine if the issue lies within the motor, electrical wiring or sensors. Our team can replace broken chains, sprockets and any other hardware parts required. If the unit has failed completely, we’ll replace it with a new one with sufficient horsepower for your gate given its size and weight. Have you noticed part of your gate is almost touching the ground? 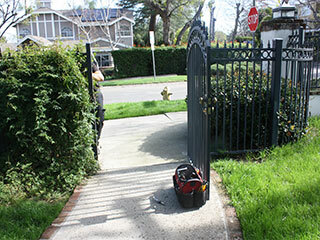 When we provide repair services, our first task is to determine the cause of the issue. Many times, the hinges are bent, worn or damaged. It is possible for the welding to have suffered damage too. We’ll fix the hinges, replace them and strengthen the welding. Remember that the best way to keep these components in good condition is to lubricate them with specially formulated grease. It is also possible for one of the posts to be leaning and/or sinking. Count on us to set it firmly in place. Whether you have a swing or a sliding gate, we are ready to help you out in the event any of your hardware components are giving you a hard time. If you have a bent track, rely on us to straighten it so you no longer have to worry about the gate getting jammed. You can count on us to fix and replace wheels and hinges too. All of our replacement parts are strong and can withstand the test of time. Contact us today at Garage Door Repair Gig Harbor - we'll be happy to speak to you!